Qualities of a good DSC measurement, such as resolution, sensitivity, baseline stability, are normally attributed to the DSC instrument performance and rarely to sample preparation and choice of crucible. However, the latter two details play an important role in the measurement quality. The crucible choice is very important for achieving reproducible DSC measurement results. Figure 1. Schematic of the Concavus crucible on a flat sensor. For better illustration, the concavity of the crucible is exaggerated (in reality, it is only 10 to 20 pirn). Until recently, it was assumed that DSC crucibles should feature an absolutely flat base for guaranteeing optimum contact between the sample and the sensor. Practically, absolutely flat crucible bottoms are not feasible to manufacture and are always subject to manufacturing tolerances. This means the crucible bottom can be slightly concave to the inside or convex to the outside so that no two crucibles from the same manufacturer are alike, let alone completely planar. A more significant feature for repeatable measurements than a perfectly flat crucible bottom for reproducible measurements is reproducible contact between the crucible base and the sensor. Concavus crucibles have slightly concave bottoms that contact with the sensor along the crucible’s outer ring, whereas the inner side of the crucible is flat. This design maximizes the reproducibility of the contact area, rather than maximizing contact area between the crucible and the sensor, even if the crucible is not placed exactly in the middle of the sensor (see figure 1). As a results, DSC measurements with these crucible exhibit excellent reproducibility. Figure 2 shows DSC measurements on five different indium samples using Concavus crucibles. The evaluated onset temperatures and melting enthalpies differ by only 0.01°C (standard deviation of the onset temperatures) and 0.20% (relative standard deviation of the melting enthalpies), respectively. Another benefit of the Concavus crucible is its behavior under internal pressure. If gaseous products evolve from the sample during a DSC measurement, pressure is generated inside the crucible if it is not sealed with a pierced lid. If the crucible bottom is planar the crucible floats, as a result of the increased pressure considerably influencing the contact between the crucible and the sensor. However, if the crucible bottom (like that of the Concavus crucible) is concave, it is more pressure-resistant. Increase of the pressure inside the crucible initially leads to convexity of the lid and not of the bottom. Other than crucible choice, sample preparation also has an impact on the measurement quality. 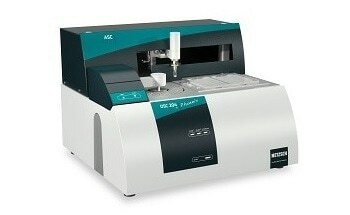 The sample must not be contaminated during its preparation to guarantee that all effects in the DSC curve result strictly from the sample itself. This implies that crucibles need to be clean and free of impurities. The Concavus crucibles are carefully cleaned and dried before shipment. The packaging of Convacus crucibles is another benefit. Normally, suppliers ship crucible in bulk in a single box. Crucibles packaged this way may suffer deformations and can stack on top each other, which makes them hard to separate. Concavus crucibles by NETZSCH are packaged in 96 separate compartments in a 3 in 1 Box as shown in Figures 3 and 4 reducing deformations and allowing easy access to crucibles. Indexing of the compartments is also suitable for sample archiving, and a sample identification booklet is included for this purpose. The slight concave geometry of the crucible base ensures consistent contact between the crucible and the sensor and reduces adverse effects of pressure build-up within the crucible during a measurement. The 3-in-1 Box is a new packaging concept that reduces crucible damage during shipment, simplifies crucible selection and handling and facilitates the archiving of samples for future reference. NETZSCH has developed a novel solution to guaranteeing measurement repeatability recognizing the importance of the crucible quality in DSC measurements.